You spend a lot of time building your lead generation programs and feeding those leads with irresistible brain food, from top-of-the-funnel blog posts to middle-of-the-funnel webinars. Then you’ve got your sales team working those phones trying to close these high-ticket deals. But sometimes, along the way, some of these leads become disengaged and opportunities are lost. It’s going to take the same amount of DEADication—and a killer content experience—to breathe life back into your dead leads and opportunities. 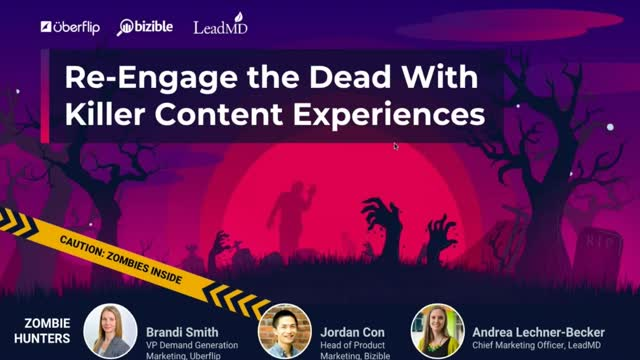 We rallied a powerful trio of zombie experts at Uberflip, LeadMD, and Bizible for this webinar to spew out some bloody-good advice on getting your dead leads to crawl out of the ground and fuel your pipeline. Admit it: sometimes even you get bored with your company's content. After all, there's a limit to how many ways you can say the same thing to the same people. Or is there? As it turns out, the answer doesn't lie in figuring out ways to reuse and recycle your content. It lies in understanding how to re-mix your content around the ideas that matter most—to you and to your customers. In this highly interactive workshop session, Tamsen will show you how to do just that. Content is the driving force behind your most effective marketing strategies, from demand generation and inbound marketing to sales enablement and account-based marketing. As marketers, you aim to personalize how your prospects and target accounts experience your content, and scaling the creation of these experiences becomes your next big hurdle. In this webinar, Uberflip’s Director of Content Experience, Paige Gerber, and Drift’s Customer Marketing Team Lead, Chris Handy, reveal five easy steps to help you focus, align your team, and truly deliver meaningful experiences so you can rock marketing campaigns that delight your prospects and customers. In the modern marketing department, roles tend to be largely defined. The content marketer creates and distributes content. The demand generation marketer turns that content into leads. The digital marketer amplifies that content’s reach. But what about that last missing piece of the puzzle—the content experience? In this short webinar hosted by Randy Frisch and Jay Baer, you'll learn about who in your organization should be owning the experience and how you can start rallying your team around the idea. Attention in today's online world is harder and harder to garner than ever before. Our clients, customers, prospects and leads tell us they have no time. No time to read our emails, download our e-books, listen to our podcasts, dive-in to our blog posts, or watch our videos. However, these very same customers can binge watch two seasons of Stranger Things on Netflix in one weekend! Where's the disconnect? Maybe, in our quest to make our content consumable we’ve eliminated every element that makes our content interesting? It turns out, the most successful content creators in the world don’t worry about how long their content is. Instead, they apply two infinitely powerful psychological phenomena to catch, keep and capture, their audience's attention. In this exhilarating presentation, former television producer and bestselling author Andrew Davis will show you how to keep your audience curious. You’ll be challenged to think like a reality TV editor, and he’ll show you the five things that brilliant businesses do to transform their content from boring to brilliant. More importantly, you'll learn the simple secret to creating infinitely engaging content. What's the secret? You'll have to wait and see. If there's anything both demand generation and content marketers care about, it's driving engagement and conversions on the content they create. In this webinar, Randy Frisch, President & CMO at Uberflip, and Jay Baer, President at Convince & Convert, pull three of the top insights in the first-ever Content Experience Report to share how you can drive real results with a few tweaks to your content experience. Marcus Sheridan — Professional Speaker, Author and Owner at Marcus SherIdan International Inc.
More than any other time in the last 100 years, the buyer of today has made a dramatic shift in the way they make purchasing decisions. Unfortunately, many companies haven’t adapted to this shift and are not prepared for the continual evolution of this “digital consumer.” In this talk, Marcus Sheridan brings clarity to the way buyers have changed and exactly what companies must do to, not only align themselves with this shift in buyer patterns but take advantage of the digital age as well. If you like to be engaged, challenged, and moved, you’ll love this keynote with Marcus Sheridan! Inbound, demand generation, ABM, and sales enablement are all driven by content. In this 9-minute webinar, Randy Frisch, President & CMO at Uberflip, and Jay Baer, President at Convince & Convert, explore how to use these strategies to bring your content to life. In this 9-minute webinar hosted by Randy Frisch and Jay Baer, you'll learn about a 5-step framework that will help you easily create personalized experiences for your marketing campaigns. Whether ABM is a relatively new concept to you, or something you’ve been doing for years, there is no debating the power of ABM lies in personalization. But let’s face it, creating personalized content experiences for each of your target accounts can be a daunting task. But does it have to be? - Build personalized content experiences in minutes—without a line of code! Email nurture campaigns are a B2B marketing must, and when executed effectively, can really move the needle and help guide qualified leads down the funnel. But isn’t it time your team went beyond the basic email nurture and took a multi-channel approach? Register for our live webinar featuring Natalie Holtgrewe, Group Director, Growth Strategy, at Intelligent Demand to hear multi-channel campaign tips from an expert. More than ever, buyers are educating themselves with content at every stage of the customer journey. And with an average of seven different buyers involved in any B2B purchase decision, the need for a personalized approach is now more critical than ever. Jason Oakley, Product Marketing Manager at Uberflip, explains how Uberflip's Content Experience Platform (CEP) enables you to create engaging, personalized content experiences at scale. Join us for a webinar with Vidyard and Spear Marketing to learn how B2B marketers are using personalized content to drive engagement. We discuss the trends in content personalization, the challenges marketing teams face when implementing it and some real-world examples of how other organizations are personalizing their content experience. Many B2B marketing teams have introduced webinars into their marketing mix. These web-based events attract qualified, invested audiences that you can convert into leads weeks before the content goes live, and months after it’s recorded. Are you making the most of this powerful lead generation asset? - How to optimize your webinar sign up process to get more registrants and how to get people to actually show up! Your marketing team spends tons of time and resources developing the right content to engage your top personas and accounts. But what if you could engage your sales team while making them look like rockstars with your content? Learn how Sigstr, Terminus and Uberflip run their ABM campaigns and empower their sales teams with content. It’s time to move away from the traditional demand gen and outbound sales tactics with a focus on pure volume and towards a personalized approach. - Win over your top accounts! 70% of marketers have pledged to create more content this year. How are you going to stand out from the increase in blog posts, ebooks, and white papers across all marketing campaigns? Learn 3 ways to transform your PDF-first marketing strategies into stronger, more engaging experiences that connect with your audience! In this fast-paced webinar, you'll learn how to use content to turn customers into volunteer marketers. Join best-selling author and digital marketing celebrity Jay Baer, and he'll unveil his framework for Talk Triggers: content that creates word-of-mouth. Do you know who your hottest leads are? Are you able to control the volume of leads passed to your sales team so that they only get their hands on the cream of the crop? Are you able to offer the right content to the right prospect at the right time? Jay Baer recently unveiled his new framework, Talk Triggers: Content that Creates Word-of-Mouth, and he has done exactly that – sparked incredible discussions among marketers everywhere on how to turn customers into volunteer marketers. Word-of-mouth is the most efficient and effective marketing tactic available, and content can (and should!) be the catalyst for those conversations. Watch this webinar to hear about Jay's new framework plus his answers to real questions submitted by B2B marketers! Watch this behind-the-scenes webinar of how Uberflip and Terminus users power their integration to build ABM campaigns that win. Gain perspective on the organizational infrastructure needed for account-based marketing to work, as well as how you can use content to drive your ABM cadence. It’s time to move away from the traditional demand gen tactics with a focus on pure volume and towards a targeted approach. And who to learn it best than from both Uberflip and Terminus’ internal ABM champions? They will be diving deep into the nitty gritty platform pluses that drive their key account engagement. Learn tips and tricks from top B2B marketers. Learn how the best B2B marketers create content, convert leads, and nurture them into customers.